Utah committed 19 turnovers through the first three quarters of Monday night’s game at Chesapeake Energy Arena, and the Thunder took advantage, steadily building their lead to 29 points before ultimately cruising to a 122-113 victory. After winning four out of five, the Jazz have suddenly dropped two straight and are now 13-15 on the season. It didn’t help, of course, that both Donovan Mitchell and Rudy Gobert were hampered by foul trouble throughout. It definitely didn’t help that no one seemed to have the faintest idea how to slow down OKC’s Paul George, who shot 8 of 10 from the field, 5 of 6 from deep, and 10 of 12 from the free-throw line for 31 points. Mostly, though, what proved least helpful of all was the Jazz’s inability to not cough up the ball, to not commit a plethora of miscues throughout. They had six turnovers in the first quarter, and trailed by eight. Then came six more in the second quarter, and the deficit was 11. The third period yielded seven more turnovers, and OKC poured in 42 points and expanded its advantage to 24. But then, this game went sideways from the outset. Playing on the second half of a back-to-back set against a tough, physical, energetic Oklahoma City team, the Jazz fell behind 6-0 in the first 1 minute, 8 seconds of action, forcing Snyder to burn a timeout to try and get his team settled down. Despite that, the Thunder never trailed. A strong fourth-quarter performance by the bench unit with the game decided wound up boosting Utah’s field-goal percentage to 51.2 for the game, but that was a bit of fool’s gold. The Jazz made just 8 of 29 attempts from deep — 27.6 percent — in the game, and every positive step was met with a fierce Thunder response. Center Rudy Gobert, who totaled 13 points and 14 rebounds in 21 foul-plagued minutes, said OKC’s strength, length, and speed defensively proved problematic all night. A bench unit led by Ekpe Udoh’s 10 points on 5-for-5 shooting and Dante Exum’s nine points and three assists made the final score perhaps more respectable than it deserved to be. Prior to that, though, too many of the little things simply went in the Thunder’s favor. OKC big man Steven Adams, who finished with 22 points and seven rebounds, snared offensive boards over Gobert on consecutive possessions early in the third quarter. The Thunder converted both times, expanding their lead to 73-58. That sequence was symptomatic of the whole game for the Jazz. 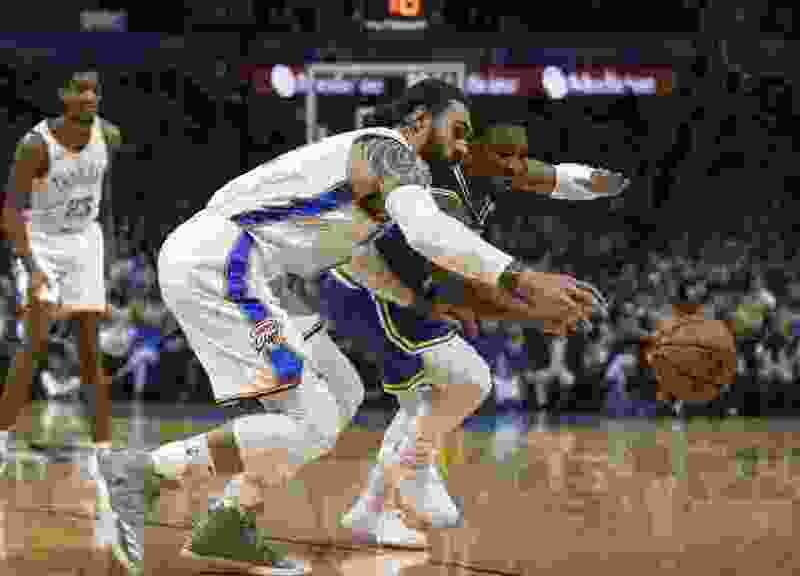 • Utah commits 20 turnovers, including 19 in the first three quarters, and Oklahoma City leads by as many as 29 points in handing the Jazz a second consecutive defeat. • OKC’s Paul George makes 8 of 10 shots from the field, and goes 5 of 6 from deep for a game-high 31 points. • Donovan Mitchell leads Utah with 19 points, but also commits a team-high six turnovers.